Carter the coyote is oblivious. To the passersby at UBC, to their stares, to his (or her) own celebrity, even. As of Wednesday afternoon, Carter, who’s been hanging around UBC’s Point Grey campus for a couple of weeks, had 4,600 likes on his (or her) very own Facebook page as well as an Instagram account. The Syrup Trap, a humour magazine, playfully wrote that Carter is now $21,000 in debt on an outstanding student loan. “I don’t know, yesterday I lost my way in the forest and ended up wandering around the campus for a few hours,” Syrup Trap quotes Carter as saying. “Next thing I know, I’m getting an email from NSLSC (the National Student Loan Service). Carter has become a video star all over the web: Wandering where he (or she) pleases, catching a squirrel for lunch, stopping to take in all those gawkers, standing lookout at the Sauder School of Business, squatting in the middle of the road to … hey, Carter’s a she! And she’s as comfortable and easygoing as the Littlest Hobo, making a new friend at every stop. And that’s a problem. In Carter’s case, familiarity could be terminal. Coyotes are shy and not known for aggression, said Dan Straker, urban wildlife programs co-ordinator with the Stanley Park Ecology Society. 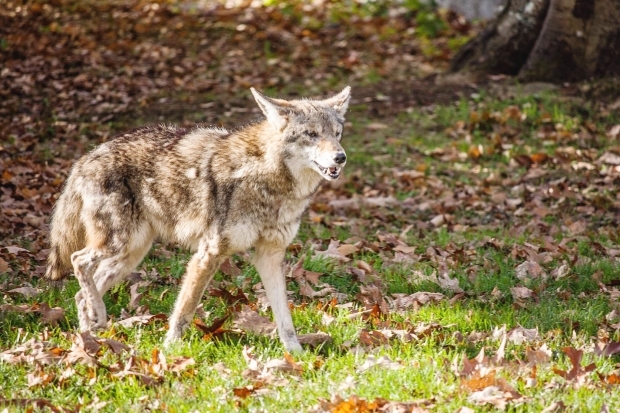 There are 300 to 400 coyotes in Vancouver alone, he said, and the fact that public appearances such as Carter’s are so rare speaks to how timid they are. When the odd one does appear it’s often at this time of year when they’re fattening up for winter. For which, by the way, there exists a $345 fine. And for goodness sake, don’t try to pet her. The fact Carter is such a starlet actually helps wildlife officials keep tabs on her. So far, despite the fact she sometimes gets cornered by fans wanting to snap photos or take video, she’s shown no signs of aggression. Wildlife officials would rather folks scare her than stare at her. Were Carter to snap at someone getting too close, say, there aren’t a lot of options open. The protocol then is that conservation officers from the Ministry of the Environment would be called in.